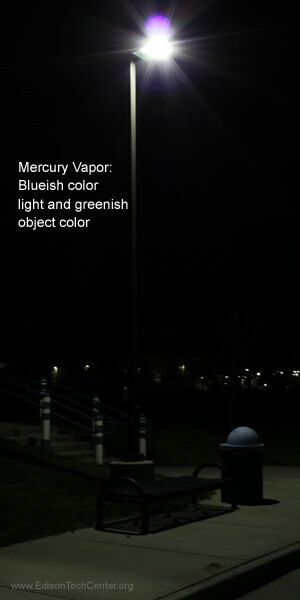 The mercury vapor lamp is a high intensity discharge lamp. It uses an arc through vaporized mercury in a high pressure tube to create very bright light directly from it's own arc. This is different from fluorescents which use the mercury vapor arc to create a weaker light that mainly creates UV light to excite the phosphors. The "Merc" as it is known has been a workhorse for society; lighting streets, factories and large areas for over 100 years. Common uses: large areas like parks, street lighting, high ceiling buildings, gyms. Low pressure lamps with a quartz envelope are used for germicidal purposes since they allow UV light to pass. 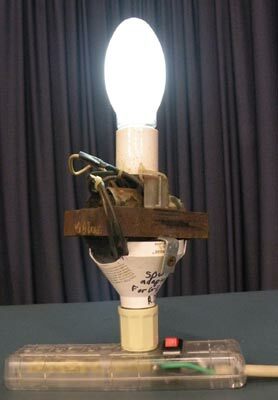 Above is a "Lifegaurd" brand lamp by Westinghouse, it needs a ballast to run. UV rays are produced, but blocked by the borosilicate glass. There are several versions of the lamp but the basic principle is the same. 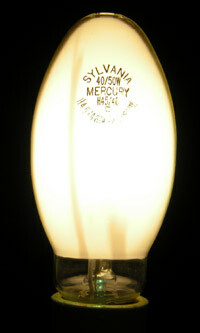 The first mercury vapor lamps were in a lower pressure tube. 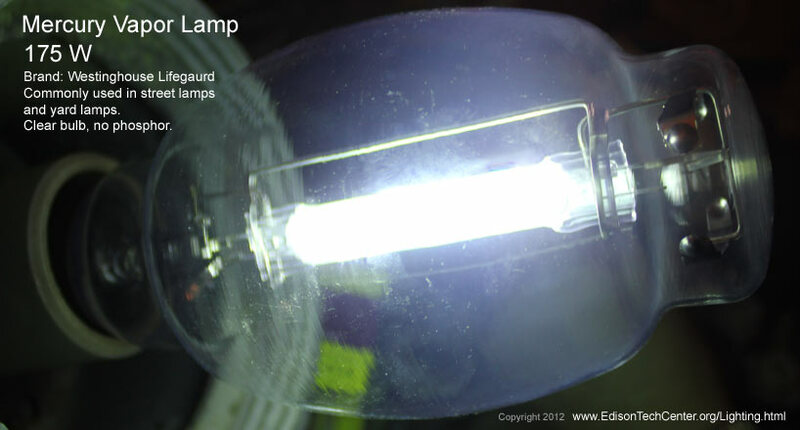 One would tip the lamp, and electrical contacts on each side of the lamp would send electricity through a liquid mercury which started the lamp. After that the lamp would heat fast and mercury became a vapor. The light would intensify as the arc grew stronger in the tube. 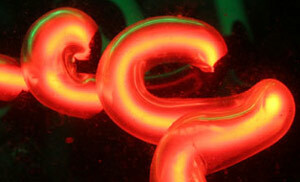 Lamps of today are high pressure lamps with a fused quartz inner discharge tube. The high pressure helps increase efficiency and this was developed in 1936, 35 years after the low pressure lamps came out. To prevent the arc from infinitely getting stronger a ballast limits the current. 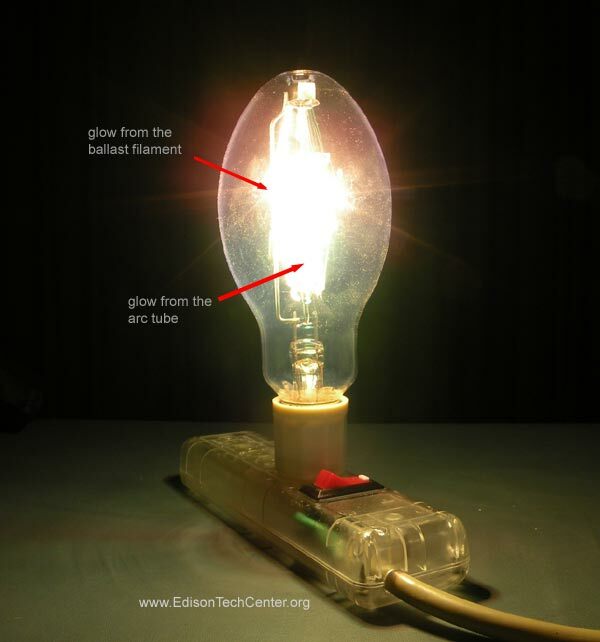 Some lamps are "Self Ballasted", they use an incandescent filament to act as a resistor, limiting current. Home lighting fixtures usually use the self-ballasted type where as the more expensive but more efficient ballasted lamps are found in large fixtures for municipal lighting. 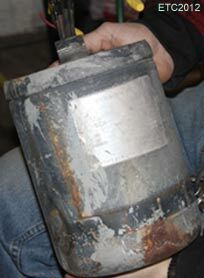 The photo below shows a self-ballasted lamp, notice the tungsten filament. 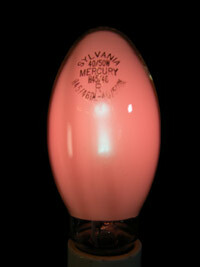 In this clear bulb zinc and cadmium are metals used along with the mercury to help color and brightness. 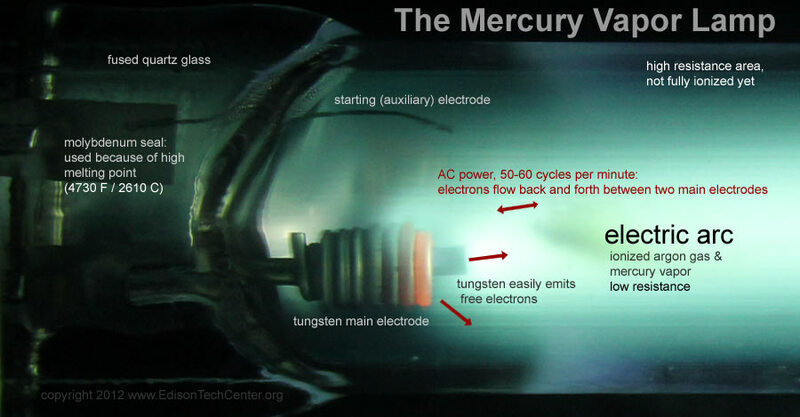 A Mercury Vapor with a transformer (ballast) build into the base. The bulb at left is just warming up, the bulb at right is after a few minutes of warming. 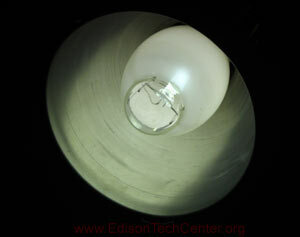 This bulb has phosphor to help make the light more of a true white color. It can take several minutes to warm up. Charles Wheatstone (London) worked with arcs through mercury during this tests in spectropy. He would create an arc through a metal, then observe what colors it produced when a prism separated the light into it's individual frequencies. 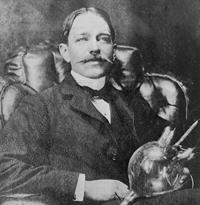 John Thomas Way (London) Developed a mercury vapor lamp. He tested them on the Hammersmith Bridge in London. 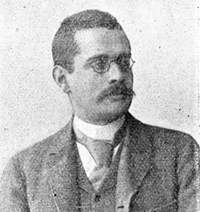 Leo Arons, (University of Berlin). His lamp worked fine but had a green blue color that was not acceptable to most people. 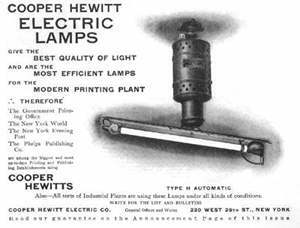 Peter Cooper Hewitt (New York City) had a history of innovations in other fields, and when he set about on the project of the mercury vapor lamp in 1898 it only took 3 years to develop the first reliable lamp with a acceptable color of light. His work was a commercial success and eventually his company and patents were bought out by General Electric in 1913. Please contact us if you are a historian and wish to correct or improve this document.